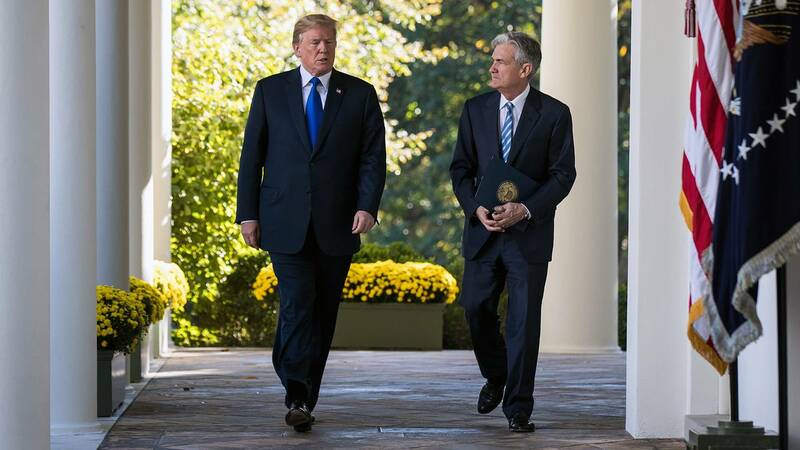 President Donald Trump walks with then-nominee for the Federal Reserve Chairman, Jerome Powell, on Nov. 2, 2017. (CNN) - President Donald Trump met with Federal Reserve Chairman Jerome Powell Monday evening for an informal dinner at the White House residence to discuss the health of the US economy, according to a statement from Federal Reserve. The dinner, which had not been on the President's public schedule, comes weeks after White House aides floated the idea of inviting the former investment banker to sit with Trump in person to allay his concerns about a string of rate hikes. Historically, Federal Reserve chairs have met with sitting presidents from time to time, but Powell noted last month while speaking at the Economic Club of Washington such meetings tend to be "rare." Trump has repeatedly railed against the Fed's rate changes, breaking precedent by openly attacking Powell and expressing his hopes, via Twitter, that central bankers would keep rates steady. Such a move could risk letting the economy overheat amid continued strong hiring. The President's dissatisfaction over increased market volatility heightened late last year, leading Trump to ask advisers whether he could fire Powell, even though it's unclear whether presidents can legally fire their Fed chairs. Also attending the dinner was Powell's deputy Richard Clarida, also a Trump appointee, and Treasury Secretary Steven Mnuchin, who meets regularly with the Fed chairman. The meeting comes less than a week after Powell cautioned that "the case for raising rates has weakened" following a two-day interest-rate policy setting meeting in Washington. There, the Fed signaled plans to slow down raising interest rates this year amid rising economic uncertainty, after penciling in two rate hikes. With global economic growth slowing down, ongoing trade tensions and more recently, a protracted government shutdown, the Fed has said it plans to take a more "patient" approach this year. "We believe we can best support the economy by being patient and evaluating the outlook before making any further adjustment to policy," Powell told reporters last Wednesday at a press conference. The Fed statement on Monday said Powell did not convey a different message to the President than what he explained to the public following the central bank's first meeting in 2019, and that he did not discuss what he expects the Fed to do next in setting future interest rates. Instead, he stressed to the President and Mnuchin "that the path of policy will depend entirely on incoming economic information and what that means for the outlook," according to the statement. Powell told the President that he and his colleagues would chart the course of future policy to support its mandate set by Congress and would make decisions based "solely on careful, objective and non-political analysis." Last week, Powell denounced any idea that the Fed was caving to political pressure by taking a more dovish approach. "My only motivation is to do the right thing for the economy and the American people," said Powell. "The situation calls for patience, I think it does. That stance of policy is appropriate. We see these uncertainties. We see a time where we have the luxury of being able to wait."